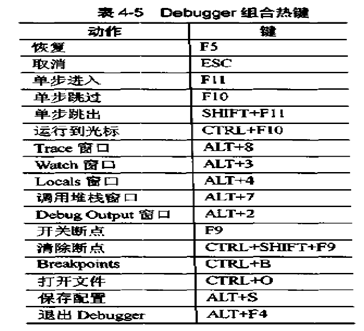 这是我从Visual C++ 6.0 MSDN Library October 2001中查来的,在My Note中有很多是从那里参考的.强烈推荐大家看这份英文说明. 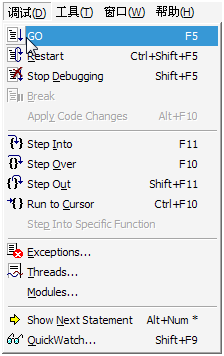 Single-steps through instructions in the program, and enters each function call that is encountered. Executes the program as far as the line that contains the insertion point. This is equivalent to setting a temporary breakpoint at the insertion point location. Attaches the debugger to a process that is running. Then you can break into the process and perform debugging operations like normal. Executes code from the current statement until a breakpoint or the end of the program is reached, or until the application pauses for user input. (Equivalent to the Go button on the Standard toolbar.) When the Debug menu is not available, you can choose Go from the Start Debug submenu of the Build menu. Resets execution to the first line of the program. This command reloads the program into memory, and discards the current values of all variables (breakpoints and watch expressions still apply). It automatically halts at the main( ) or WinMain( ) function. Terminates the debugging session, and returns to a normal editing session. Halts the program at its current location. Single-steps through instructions in the program, and enters each function call that is encountered. When the Debug menu is not available, you can choose Step Into from the Start Debug submenu of the Build menu. Single-steps through instructions in the program. If this command is used when you reach a function call, the function is executed without stepping through the function instructions. Executes the program out of a function call, and stops on the instruction immediately following the call to the function. Using this command, you can quickly finish executing the current function after determining that a bug is not present in the function. Executes the program as far as the line that contains the insertion point. This command is equivalent to setting a temporary breakpoint at the insertion point location. When the Debug menu is not available, you can choose Run To Cursor from the Start Debug submenu of the Build menu. Single steps through instructions in the program, and enters the specified function call. This works for any number of nesting levels of functions. Displays the Exceptions dialog, which you can use to specify how you want the debugger to handle your program exceptions. Displays the Threads dialog, which you can use to suspend, resume, or set focus to progam threads. Shows the next statement in your program code. If source code is not available, displays the statement within the Disassembly window. Displays the Quick Watch window, where you can work with expressions.